← Marybeth Whalen. The Guest Book. Grand Rapids, MI: Zondervan, 2012. 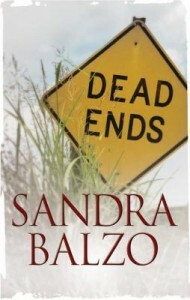 Sandra Balzo. Dead Ends. Sutton, Surrey, England: Severn House, 2012. AnnaLise Griggs has built a life as a journalist in Wisconsin, far away from her childhood home in the fictional town of Sutherton, North Carolina. But when her mother begins having health issues and an affair with a married man has a messy end, AnnaLise takes an extended leave of absence and returns to her home to the North Carolina mountains. She’s worried about her mother, but expects her month-long vacation to be relatively uneventful. Then Ben Rosewood, her erstwhile beau, shows up with his wife Tanja and college-aged daughter Suzanne. Suzanne is starting as a freshman at a prominent local university, so Ben’s appearance isn’t all that suspicious, but AnnaLise still feels stalked. She ended things with Ben, and he was less than agreeable to the idea. When his wife Tanja is killed in a car accident that turns out not to be an accident, AnnaLise immediately suspects he’s gone off the deep end in order to be with her. But could the steady, very sane Ben Rosewood she knew in Wisconsin really murder his wife in cold blood? Between her mother’s memory lapses and a potential murderer, AnnaLise’s vacation is shaping up to be less vacation and more work than expected. Balzo’s second novel in her new Main Street Murders series gets off to a fast-paced start as her heroine applies all of her investigative skills to the case.